The management of natural resources focuses on the dynamics between natural resources and people. Our use of natural resources, and decision making regarding natural resources, is not shaped purely by biophysical characteristics of the resources, but in large part by who can use and manage them. Unequal relations – usually defined by social differences of gender, ethnicity, socio-economic class, age, and so on – translate into inequalities among people in their access to and control over resources, and thereby influence the benefits and adverse effects that different people, and nature, experience. 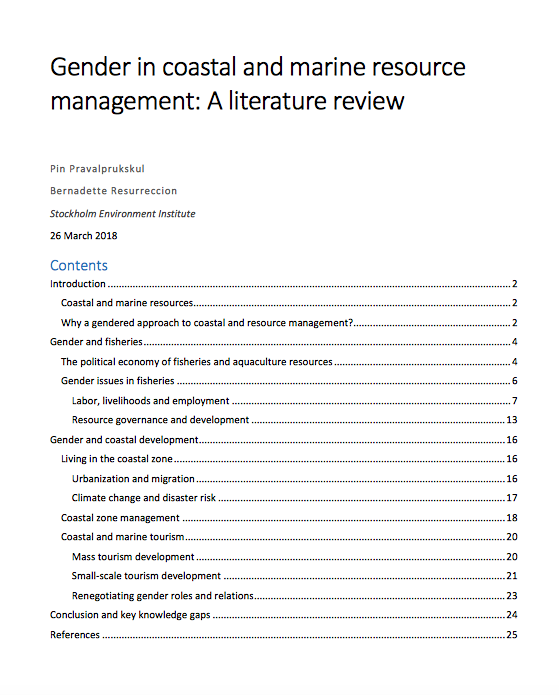 Studies on gender issues in coastal and marine resource management have revealed deep gender and social inequalities. Fishery studies and management have been largely gender-blind, despite the highly gendered nature of the sector. Although women are crucial to the fisheries sector, their roles are often undocumented and therefore rendered invisible to researchers and policy makers. This is because national policies, driven by production targets and concerns with overfishing, prioritize the primary production of fish over other parts of the supply chain that women dominate, and other gender and social issues around fish production, such as decision making and access to productive resources such as credit and skills upgrading. The lack of recognition of women’s contributions to the sector’s economyand to food security undervalues the economic and social benefits they provide. It also marginalizes women in the implementation of sectoral policies and increases their vulnerability, especially in small- scale capture fisheries which are already marginalized within the fishing industry. The inclusion of women’s roles and contributions in research and practice in the sector is therefore essential to addressing inequality.